Creel Pone here resuming the regular one-a-week schedule for the next few weeks / months, starting off here with easily the noisiest entrant since Pierre Henry’s “Mise en Musique” - possibly even moreso! 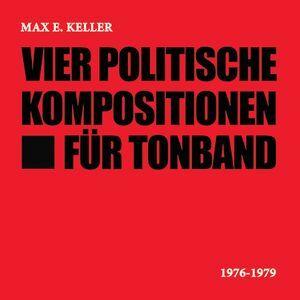 - a split LP of Socialist Text-Sound & Musique Concrète works by composers Max Keller and Martin Schwarzenlander. The A-side piece, Keller’s “Sicher Sein...” interjects continuous, ululated German / Austrian texts with jabs of random, synthesized noise, sample-and-hold bleeping, and piercing high-drones; but the real score here is on the B-side c/o Schwarzenlander’s two pieces: “Erst Wolt Ihr Den Petersbrunnhof Dann Hellbrunn und Schliesslich Gar Schloss Mirabell” is a woozy Plunderphonic piece rife with atonal synth, wafting along until around the 8-minute mark, when some rather nasty speaker-clip sounds rise and take over. “Unter Dem Pflasterstein ( Noch Immer ) Liegt Der Strand” hits us pretty much straight away with a minute-long rise into sheer volume, followed shortly thereafter by a dense bit of harsh tape cut-ups and continues on-track until the piece’s climax. Politics aside, this is just incredibly impressive music; its date-of-inception causing many a double-take around these parts. Fans of the Logothetis Creel Pone take note.